The development of phase coherent electronics has partially consisted in probing to which extent the concepts of quantum optics could be adapted to electronic conductors. Here, we contribute to a unified description of electric transport in a phase coherent conductor and of the photonic degrees of freedom it is coupled to. 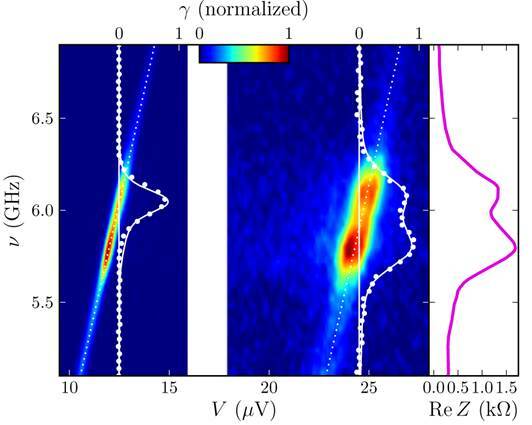 We investigate both the properties of the photons emitted by a phase coherent conductor and the feedback of the coupling to the electromagnetic environment on quantum electronic transport itself. Spectral density of the radiation emitted by a Josephson junction in the DCB regime for one-left panel- and two photon processes-middle panel. The junction is embedded in a quarter wavelength resonator, which impedance is given by the right panel.